Summary: Nice day today. Small chance of rain Today through Thursday. Weekend is shaping up to be nice. For today, we will see a slight chance of rain at 20% after 1pm as the high temperature reaches 69 degrees. Winds will be out of the north northeast at 10 mph. 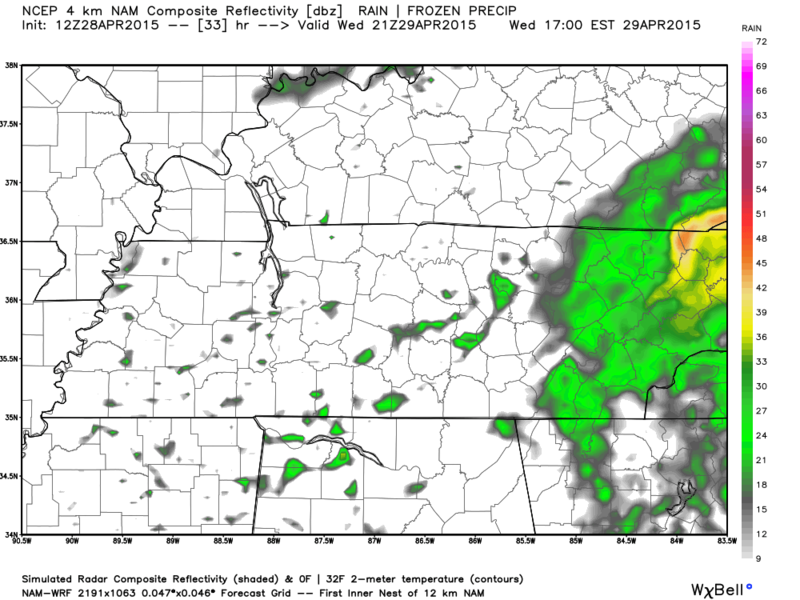 Below is the NAM4 simulated radar for 5pm tonight showing very a small chance of rain. Rain chances remain at 20% as we move into the overnight hours as a system works its way through Mississippi, Alabama, and Georgia, which could swing a shower or two our way. The overnight low should fall to about 48 degrees as the winds stay out of the north northeast at 5 mph. Here’s NAM4’s simulated radar for 4am Wednesday morning. Wednesday we are likely to wake up with a 20% chance of showers around, as the above simulated radar indicates. Our high temperature should reach about 69 degrees as winds turn out of the north at 5 to 10 mph. There may be a stray shower or two during the day Wednesday as the system to our south heads east and up through the Carolinas. Here’s the NAM4 simulated radar for 4pm Wednesday. Wednesday night our temps will drop to about 48 degrees while the winds start to calm down. Our rain chances remain minute if any as we sleep Wednesday. Thursday we see a small 20% rain chance in the afternoon as our temps work their way to 68 degrees for the high. 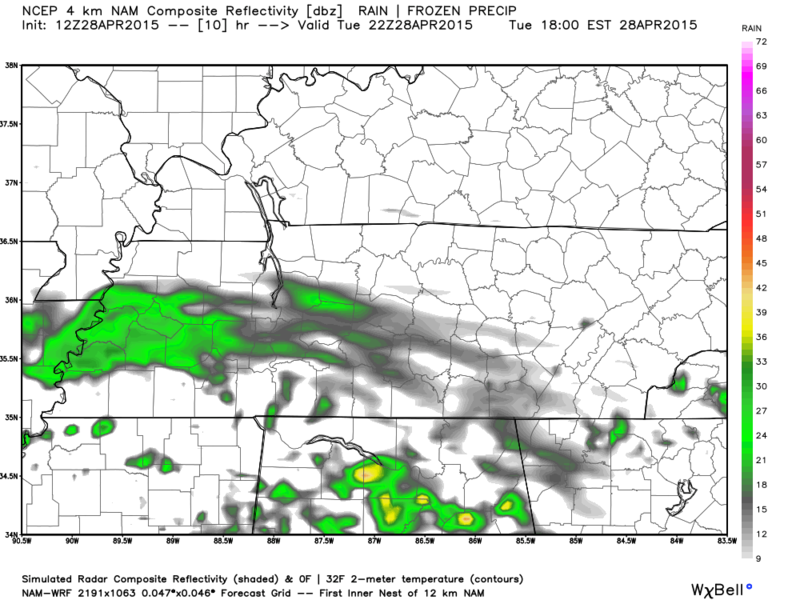 The NAM4 simulated radar shows a small chance of rain around 1pm on Thursday, but this is likely to change. Expect a stray shower or two as you go through your Thursday. Since I’m sure most of you want to know how the weekend is going to look, the weekend is going to be perfect. Expect a high temperature of 73 on Saturday and 79 on Sunday with no chances of rain!